Weinheim : Wiley-VCH ; Chichester : John Wiley [distributor], 2006. 1 The Invention.1.1 First Observations 1950/1953.1.1.1 Standard Oil of Indiana.1.1.2 Phillips Petroleum Company.1.1.3 Du Pont.1.1.3.1 From the Beginning up to the Patent Application.1.3.1.2 Only a Scant Experimental "Polypropylene. "1.2 Max-Planck-Institute, Mulheim on the Ruhr.1.2.1 K. Ziegler, H. Breil, E. Holzkamp and H. Martin.1.2.2 Experiments between May and December, 1953.1.2.2.1 Montecatini Points to the Contractual Rights and Obligations.1.2.3 Experiments from December 1953 through April 1954.1.2.4 Letter from Ziegler to his Patent Attorney von Kreisler.1.3 Montecatini, Milano/G. Natta and Co-workers.1.3.1 The First Experiments with Ziegler catalysts.1.3.2 Natta, Orsoni and DeVarda's Visit to Ziegler at Mulheim on May 19, 1954.1.4 K. Ziegler and Co-workers.1.4.1 H. Martin: Experiments May-July 6, 1954; H. Breil: Masters Thesis.1.4.2 H. Martin, July 1954: Polypropylene.1.5 1952-1954 Polypropylene (Review).1.5.1 Appraising the Historical Course of the Invention from a Year-2000 Vantage Point.References.2 The Chemical Industry Connection.2.1 Farbwerke Hoechst.2.2 Petrochemicals Limited.2.3 Steinkohlenbergbauverein (Hard Coal Mining Society)/Bergwerksverband (Mine Association)/Ruhr Area Coal Industry.2.4 The "Run" of Prospective US Licensees.2.4.1 Hercules Powder Company.2.4.2 Gulf Oil, Koppers, Dow, Union Carbide and Monsanto.2.4.3 Esso, the Straggler.2.4.4 Du Pont.2.5 Mitsui Chemical, the First Japanese Licensee.2.6 Summary.2.7 Back to the Ruhr: Ruhrcoal and Bergwerksverband.2.8 August through December 1954: Montecatini steps up its own Developments.2.9 The first Ziegler/Montecatini Pool-Agreements.2.10 Polydiene.2.10.1 Karl Ziegler and H. Martin/Max-Planck-Institute for Coal Research; S. E. Horne/Goodrich Gulf Chemicals Inc.; Giulio Natta and Co-Workers/ Montecatini; D.R. Smith and R.P. Zelinski/Phillips Petroleum Co.References.3 Patent Rights Worldwide, Patent Applications: Prosecution, Oppositions, Priority Rights.3.1 The Package of the First Six German Patent Applications.3.2 Foreign Patent Protection for the Inventions of Ziegler and Co-Workers.3.3 The Situation in the United States.3.4 Polypropylene: Ziegler/Natta, Conflict as to the Priority.3.5 Contention Proceedings.3.5.1 Montecatini.3.5.2 Du Pont.3.5.3 Compromise and Concessions.3.5.4 Du Pont Sought Further Advantages.3.6 The History of Patent Issuance from a Year-2000 Vantage Point.References.4 Innovation, Market Development, Production.4.1 The Market Situation.4.2 The Rush for Licenses 1953-1972, Lucrative Second Half 1970-1990.4.3 The Marketing of Ziegler Polyolefins.4.4 Montecatini's Pool Polyolefin Licenses.4.5 Research and Production.4.6 Early "New", So-Called Independent Catalysts.4.6.1 Case 1.4.6.2 Case 2.4.6.3 Case 3.4.6.4 Case 4.4.6.5 Case 5.4.6.6 Case 6.4.6.7 Case 7.4.6.8 Case 8.4.6.9 Case 9.4.6.10 Case 10.4.6.11 Case 11.4.7 The Split between Montecatini and Ziegler in the United States.4.8 Review.References.5 The American Challenge.5.1 Hercules, Esso, Phillips, and Dart seek Advantages.5.1.1 Infringement Action Ziegler versus Phillips Petroleum.5.1.2 Hercules forces Ziegler into Legal Action against Dart.5.2 Between Dallas and New Orleans.5.3 Eastman Kodak.5.4 Max Fischer, Over and Over.5.5 Amoco, Arco and Novamomt launch New Attacks.5.6 18 Years of Feud with Dart.5.6.1 Determination of Liability.5.6.2 Decision Concerning the Amount of Damages.5.7 A Tentative Record of the "115 Patent".5.8 Lex Ziegler.5.9 Product Patent Protection for "Polypropylene. "5.10 "High Speed" or "High Mileage" or "Ziegler Catalysts of the Second and Third Generation. "5.11 Japanese Export of Automobiles to the United States.5.12 "The Last Chapter. "5.13 Epilog.References.Index. 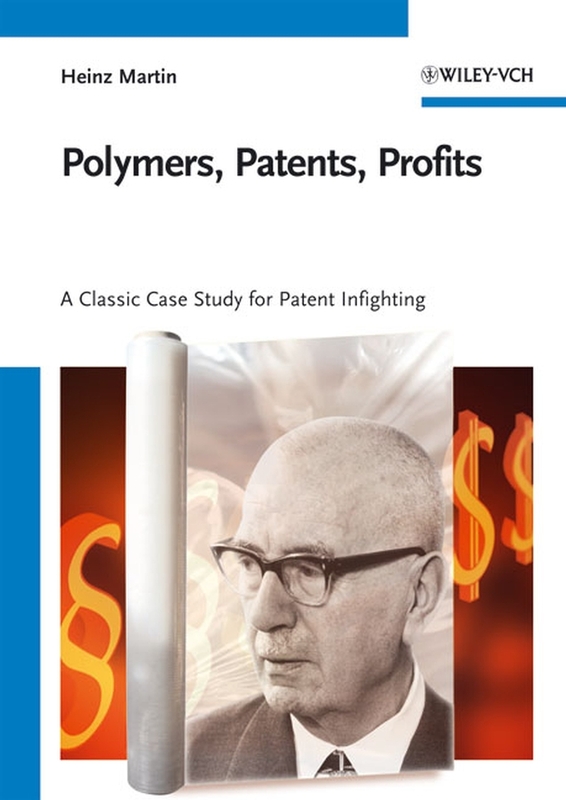 Add tags for "Polymers, patents, profits : Karl Ziegler, the Team, 1953-1998". Be the first.